Bernard Moon is a co-founder and general partner at SparkLabs Global Ventures. Our team has been actively investing in fintech for the past two years. In addition to reading pitches from hundreds of companies and meeting with dozens, half of our team has worked in the finance sector in previous careers. SparkLabs Global has invested in 13 fintech companies from the U.S., U.K. and Sweden, and we were the only follow-on fund for the inaugural cohort of the Barclays Accelerator program. With this accumulated knowledge, we decided to create an easy to read overview for others to get up to speed on how innovation and technology will disrupt the financial sector. Here is our full report; the following is a summary of what we’ve learned so far. There has been a flurry of activity over the past several years. From startups to established technology ventures such as Alibaba and PayPal, companies are working to disrupt and capture market share from traditional financial institutions — which are truly giants compared with the upstarts of today. In China, and Asia in general, mobile payment penetration is ahead of the rest of the world. The third-party mobile payment market in China increased 69.7 percent in 2015, to $1.5 trillion by GMV, with Alipay (Alibaba) capturing 68.4 percent of the market, followed by Tenpay’s (Tencent) 20.6 percent. We believe the initial entrepreneurial activity and transaction volume has been from the first layers of disruption in fintech (i.e. 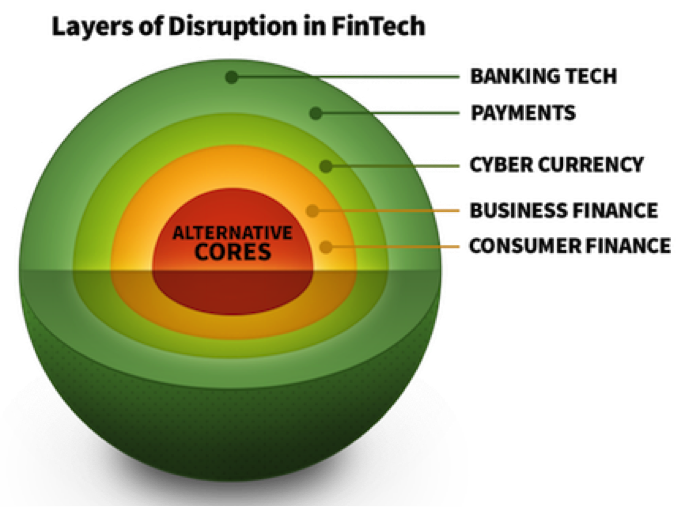 banking tech, payments), but long-term and more game-changing innovations will occur in the next layers. Ultimately, this will lead to new startups and technologies changing the core of the finance sector: commercial banking and insurance (life, health, property). The financial sector represents 7 percent of the U.S. economy, and has grown over the past decade. But with the loss of trust since the last economic crisis, and rapid pace of innovation, nothing is too big to fail. Wells Fargo had more than $86 billion in revenues in 2015 with a market cap of $254 billion, but Nokia in 2000 had a market cap of $300 billion with $28 billion in revenues. Today, Nokia is down to a market cap of $26 billion and a shell of its former self. In 2008, Nokia had 38 percent of the global mobile phone market; today it’s down to a couple of percentage points of the global smartphone market. We believe the two biggest long-term opportunities for startups are in replacing the banks and insurance institutions themselves. With new technologies, such as artificial intelligence and better data analytics, coupled with changing consumer mindsets, such as the growth of mobile smartphones and millennials hating traditional banks, these industries are ripe for disruption. There are companies, such as BankMobile, that have made early attempts to become the Bank of America of this new age. An earlier attempt, Simple, was disappointingly acquired by BBVA for $117 million. I personally was rooting for Simple to become a viable challenger versus traditional banks instead of an early casualty. Change is coming, and it is inevitable. South Korea, which is a bellwether for numerous technology trends across the globe (i.e. VoIP, micro-transactions, virtual goods), has more than 55 percent of their population using mobile banking and more than 10 percent substituting mobile payments for their credit cards. These changes in behavior have led all the major banks to start shutting down ATMs and bank branches over the past couple of years. This is not just a sign of technology creating efficiencies within these institutions, but rather a strong signal of opportunities available for entrepreneurs in Korea and across the globe. For the insurance industry, there are so many opportunities for entrepreneurs and investors with patience because you are dealing with a highly regulated industry. Within the health insurance space, I believe we will be seeing more plays such as Oscar, a new health insurance company backed by Google Capital, Founders Fund, Khosla Ventures, Peter Thiel and others. Also the growth of self-insured plans from large companies, such as Google, to many SMBs have dramatically increased the number of people under employer group ASO (administrative services only for self-funded business) to 115.6 million covered lives. This creates opportunities for such startups as Collective Health, which provides solutions for self-funded companies. There are many gaps in other insurance markets, such as life and property. Only 44 percent of U.S. households (2013, LIMRA) have life insurance, so many families are at financial risk. This is a $15 trillion unmet life insurance need. It’s interesting, because 83 percent of people say they don’t want to buy life insurance because it’s too expensive, but they believe life insurance costs more than three times the actual price. This industry is begging for more entrepreneurs to disrupt and change it. 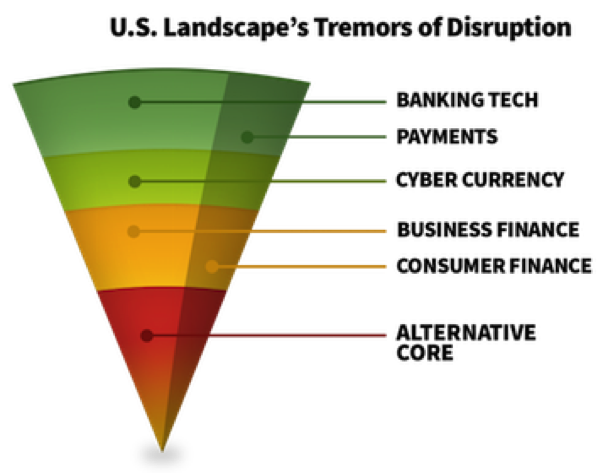 Going back to commercial banking… as startups attack the revenue streams of banks, they will slowly erode the profitability of these traditional institutions. Already half of all commercial (retail) bank customers are unprofitable, so I believe this downward trend will continue over the next decades. Even with the recent hiccups within the peer-to-peer lending space (Disclosure: Our fund invested in Payoff, a financial wellness company with loan product), I believe this is just a minor setback and these new players will continue to slowly erode traditional consumer and commercial lending. The current leader, Lending Club, went public last year and has arranged more than $9 billion in loans since it launched in 2007. As a comparison, Bank of America’s consumer loan portfolio was $489 billion in 2014. More than a year ago, there was an over-demand from matching institutions, such as hedge funds and family offices, on consumer loans through Lending Club, Prosper and others. These P2P lenders couldn’t find enough qualified loans and were leaving money on the table from these matching institutions. Then the tables turned amid regulatory concerns and these institutions becoming more conservative with their capital, even before the recent ouster of Renaud Laplanche, Lending Club’s CEO. Now there will certainty be more scrutiny from regulators because of Laplanche’s behavior. Prosper also laid off 28 percent of its staff recently, and most of these P2P lenders are now expanding their offerings to other financial offerings, such as mortgage lending and wealth management. While I may sound delusional, I still believe all of this is just a bump in the road, and peer-to-peer lending will grow in the long-term and change the traditional consumer and commercial lending industries. Fintech is not an area where we will see the rapid changes and growth as occurred in mobile messaging, or even the mobile phone industry with Apple’s takeover of Nokia. Startups challenging the financial sector are playing the long game; there will be no overnight successes. I believe we won’t see comparable giants from these crops of startups until a decade out — but change is coming, and it is inevitable.